In this eyeball-centric times, listening to live radio is not only a breath of fresh air, but it also lets you follow your favorite local stations on the road wherever you are in the country (or the world), thanks to a little thing called livestreaming over the Internets. Have your iPhone or Android with you? Of course you do, at all times. How about installing a radio live stream aggregator in the form of an app, and start beaming your favorite music or program to your car stereo while keeping your eyes on the road, and hands on the wheel. Sounds like a great way to keep in touch with local news from back home, but that's not all there is to it. 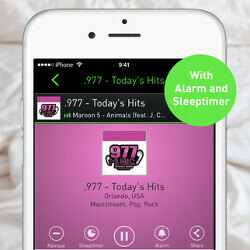 The best live radio streaming apps offer audio versions of TV programs for instance, or news outlets streaming exclusively on them 24/7 so anyone with a data connection who needs their eyes occupied with other things can keep in sync with what's happening. Here are some of the best live radio streamers for your Android or iPhone, to help you rediscover the beauty of sensory simplicity once again. TuneIn Radio is an Editor's Pick by no chance, as it offers a perplexing variety of local radio stations to choose from, encoded in a stream-suitable format that doesn't lag when beamed over. On top of that, it has obscure channels like audio documentaries, audiobooks, or web-exclusive news streamers that are guaranteed to keep you informed and entertained on the road, no matter your preferences, not to mention the famed TuneIn jam sessions. The iHeartRadio app has been around for a while, getting better with time, and its main focus are the 20+ million tunes in its catalog that you can mix and match as live radio stations, in addition to established local stations with music, news, podcasts, sports, and even comedy shows. With 30,000 stations and live podcasts to choose from, there's barely a country or even a small city that is not covered by Rad.io's app, and the selection keeps growing. Wake up to your favorite stations, keep a tag on your listening history for faster search, and discover new great programs while taking that long cross-country trip. Or better: buy a Xperia, HTC or LG phone. They have a real FM-radio. I have a fm radio in my phone, but I still use steaming apps. Don't need to have headphones plugged in, or be in trasmission range of broadcast. I also listen to stations in different geographic locations. DI.fm for the best electronic music. I don't know, like the REST OF THE WORLD who physically can't live off streaming and internet like the US? Stitcher is good for podcasts. PodcastOne is OK too. It would be nice to know more about other features of the apps as well. For instance, I currently have the TuneIn app on my phone and see that it is always registering in the running apps even if I have not initiated it. Also, do any of these apps give song information (ie: artist, album, song title), and show album cover photos? I thought TuneIn was doing that a while back but now it does not seem to - at least for the station where I had seen it before. I have an app called "mytuner radio" and it is doing great for me.